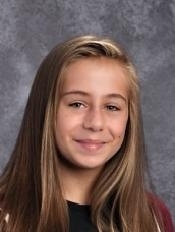 Shapleigh School seventh grader Victoria Liedecke was named Shapleigh School's Rotary Club of Kittery's Student of the Month for March, it was recently announced. Liedecke was honored at the Rotary's monthly Student of the Month Breakfast, held at Kittery Estates, on Tuesday, March 27. "Tori is a wonderfully earnest student who tries her very best on all the work that is asked of her. When the work is difficult for her, she feels comfortable asking for help. She takes pride in school and sees the value of listening, working hard, and being kind to her peers and teachers. I love having Tori in class and I look forward to watching her grow even more as we finish the seventh grade year together and she goes brightly into her future." "Tori is an outstanding student! In art class she is creative and an awesome problem solver! She works hard and always pushes herself to create high quality work." "Tori is part of our Student 2 Student Club. She is also one of Shapleigh’s Student 2 Student ambassadors. She assists incoming military and new students when they arrive at Shapleigh by giving school tours and helping out when students need support. Earlier this year we had a younger student who was struggling with his dad being deployed. Tori didn’t hesitate to jump in and help out by eating lunch with him a few times to give him a little extra attention and support during a tough time. Tori is a caring, thoughtful and kind Student! She is a sweetheart and we are so lucky to have her as a student at Shapleigh. She inspires others with her positive attitude and generous spirit! Way to go Tori. You deserve this special recognition. You rock!" "Tory exemplifies the model of an inquisitive learner. She is a pleasure to have as a member of the Shapleigh student body and a hard working member of the class of 2023." "Tori has had a great impact on her friends and classmates, often not being aware that she is influencing their work habits and attitudes toward their 7th grade learning skills. She always brings a demeanor full of infectious good spirit and energy and brightens our days at Shapleigh." "Victoria (Tori) 'sets the bar' very high for herself and works diligently to achieve her goals. Often she creates an academic atmosphere that encourages her friends and classmates to attain similar goals. She is a pleasure to work and interact with and I always look forward to WIN (our 7th grade study times) when she comes to check on the homework board to add to her personal goal list or more often, to subtract work already completed." "We are all pleased that she has been chosen to represent Shapleigh as Student of the Month." "Tori is a great addition to Shapleigh. She is positive, helpful and on task. Congrats Tori!!!" "She was a mature and dedicated member of garden group last year."